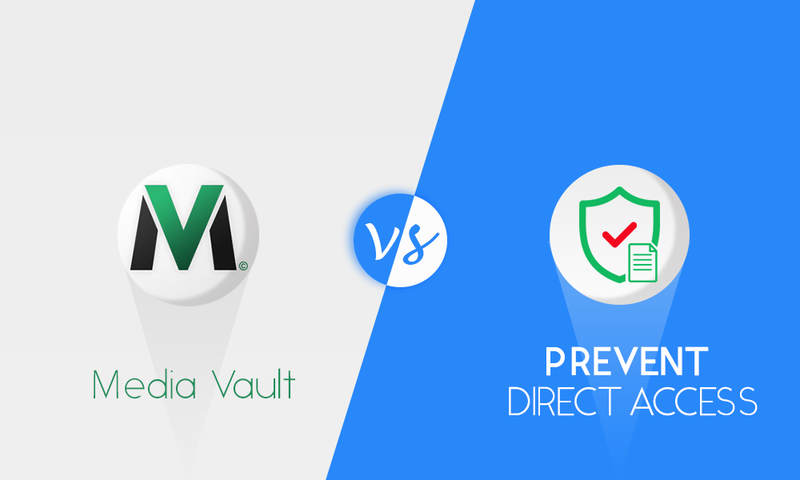 Prevent Direct Access Gold and Media Vault are the only 2 solid WordPress plugins we’re aware of that allow you to protect file uploads from public access. First of all, Media Vault is undoubtedly a terrific plugin. It’s probably a pioneer plugin in protecting WordPress files from public access. Despite the author’s limited support and dedication, the plugin’s codes are apparently very written and loved by many WordPress users. According to WordPress plugin repository, the plugin has been downloaded for more than 10,000 times while over 1,000 people are using it on their websites. These numbers say a lot about its popularity and usefulness. Born almost 2.5 years later, Prevent Direct Access Gold was actually not inspired by Media Vault. We’re not a copycat of Media Vault either. In fact, we didn’t even know about the existence of Media Vault plugin until early 2018 when we were told by one of our customers. As you may already know, in the beginning, we wanted to develop something for our own marketing purposes. First, we wanted to protect our giveaway freebies which are usually PDF files against public access (especially those coming from search engines like Google) and sharing. Second, we wanted to have something (unique URL) that we can share these private files with certain groups of people through our email newsletters. That’s why we prioritize on sharing as much as protecting WordPress media files. As a matter of fact, on our Gold version 2.0 and below, when you protect a file, a so-called “private link” is automatically generated for sharing purpose mentioned above. Also, a WordPress file is considered “protected” only when there is an active private link. That’s also why we didn’t want to build based on a complex user authentication nor integrate with other membership plugins. We didn’t even have membership site yet. Let’s see what Media Vault & Prevent Direct Access Gold have to offer. - Protect Files Instantly Under "Add Media"
Set File Access Permissions 6 options: admin users, file’s author, logged-in users, anyone, no one, custom roles. 4 options: admin users, file’s author, logged-in users, anyone. Choose any page. Default: 404 page. Show WordPress login page & a placeholder for protected image on content. First, Prevent Direct Access Gold is a theme-independent plugin. That is to say, it works with almost all existing WordPress themes. You will have no issue installing it on your existing website. Second, we go beyond just a normal WordPress media file protection by extending its features and compatibility with vast arrays of other plugins. There are currently 18 extensions that you can use with Prevent Direct Access Gold to extend and enhance its functionality and compatibility. Nowadays, many hosting are making use of Ngnix as a reverse-proxy in front of Apache so that their users benefit from all features and power of Apache, and at the same time, get blazing fast load times with Ngnix. Understanding this popular server setup, Prevent Direct Access Gold now fully supports NGNIX server without using .htaccess rules. You’ll have to do some manual configurations on your NGNIX server though, which are done automatically on Apache. With your hosting provider and our own friendly support, this should be done rather seamlessly without much manual work from your side. Prevent Direct Access Gold is also compatible with WordPress Multisite network. You can activate our Gold version network-wide or on individual site. First and foremost, we understand that Prevent Direct Access Gold must work perfectly with WordPress user roles as part of its core features. That’s why we’ve integrated both default and custom WordPress user roles as well as memberships created by almost all popular membership plugins such as Membership 2, WooCommerce memberships, and Ultimate Member, with our Gold version to allow custom file access permissions. You can also integrate Prevent Direct Access Gold with the top most popular contact forms plugin such as Contact Form 7, Ninja Forms, and Custom Contact Forms so that your file uploads will be automatically protected once submitted on the front-end. Guess what? You can sync your private WordPress media files to Amazon S3 seamlessly and automatically. As a result, your private files are not only protected but also loading much faster thanks to the powerful speed of Amazon S3. You can also integrate Prevent Direct Access Gold with your Slack channel and desktop browser so that you’ll get a direct notification when there are people accessing your private download links. We don’t just stop at integration and compatibility with other platforms and plugins respectively. We also build an extension that makes use of private expiring links to protect your WordPress videos from being downloaded by unwanted users as well as tools such as IDM and FBDown Video Downloader. If you’re using a plugin that’s not yet supported and integrated with Prevent Direct Access Gold, please feel free to let us know. We always look for new ideas and feature requests. Let’s not forget, updates and support are indispensable to any software in general and WordPress plugins in particular. No matter how good and well-written a plugin is, you’d still likely bump into problems in a long run. It might be a compatibility issue with WordPress latest version or a conflict with a theme or other plugins you’ve just installed. In such case, you’d need someone reliable who can troubleshoot the issue and guide you what to do next. Media Vault plugin is unfortunately no longer maintained and supported by its author. In fact, its last resolved support ticket and plugin update was more than 3 and 4 years ago respectively. On the other hands, we strive to provide world-class support to all our customers. Almost all support tickets are answered within 2 working days max. You have helped a lot!! With our constant growth and trust from thousands of customers. Today, we’re really proud and happy to take over the Media Vault’s mission to help thousands of individuals, agencies, and small business owners to protect and prevent direct access to their WordPress media files.